While demonstrating the computational capabilities of their new Maxwell GPU, Nvidia successfully proved the authenticity of the photos taken during the Apollo 11 moon landing. To celebrate the launch of the Maxwell GM204 chip found in their GeForce 980 and 970 graphics cards, Nvidia used 3D imagery to help validate photos of the moon landing and silence some conspiracy theorists who believe the event was faked. Researchers working with the chip managed to recreate the moon landing using a "globally illuminated" 3D model of the lunar lander, the astronauts, and the surface of the moon. The company used realistic lighting from authentic light sources to create the visual effects and shadows in its 3D landscape. The computer model incorporated separate 3D voxel grid structures that stored direct and indirect scene lighting that was used for global illumination calculations. These calculations factor in how light shines from direct sources and then refracts off indirect sources. Conspiracy theorists have argued that the original picture taken in 1969 of astronaut Buzz Aldrin climbing down the ladder was doctored- since Aldrin should have been in the shadow of the lunar lander. According to Nvidia's researchers, the shadow argument can be countered by demonstrating how indirect illumination from the moon's surface shone on the back of the lander and Aldrin. A high amount of reflected light bounces off the surface of the moon, which explained why Aldrin was visible in the picture. Another argument raised by conspiracy theorists concerns the lack of atmosphere on the moon and the fact that the stars are unable to be seen in the picture. The explanation behind this was Armstrong set the camera with a specific exposure setting. The camera was set at a low f-stop to prevent the sun from overexposing the image. Adjusting the f-stop in the simulation made the stars visible, but looking at the sun flooded the image. 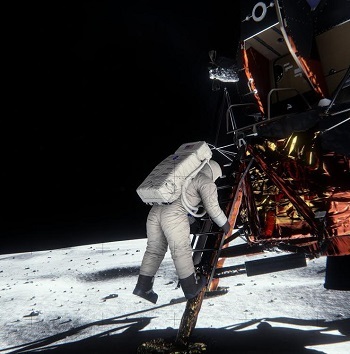 To make their final point regarding the accuracy of the 3D model using voxel illumination, Nvidia compared the simulation to the real photograph of Aldrin descending the ladder. To the naked eye, the two images were identical. Click here for more Science and Tech news on The Escapist!